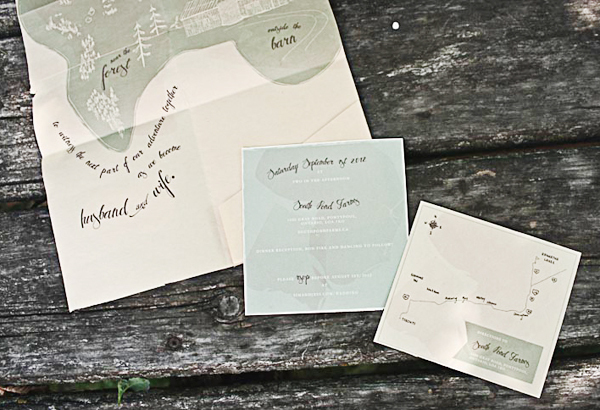 UK-based designer Belinda Love Lee sent over these pretty wedding invitations that she designed for a recent client – all inspired by the wedding’s picturesque location by a pond and in a meadow! Belinda designed a fold-out map to enclose the main invitation with illustrations based on photos of the venue. Whimsical hand lettering serves as the perfect finishing touch! From Belinda: Jess and Sim wanted their wedding invitations to be whimsical and to tell a story. I designed the invitation in the form of an hand-illustrated map, where it unfolds and your eye follows each illustration down leading to the main invitation card. The best apart about it is that Jess and Sim literally got married by a pond, in the meadow, near a forest, just outside a barn! I used photos from their wedding location to help me illustrate. The invitation suite is completely hand made, from print to production. Check out the Designer Rolodex for more tal­ented wed­ding invi­ta­tion design­ers and the real invitations gallery for more wedding invitation ideas!